I'm not any sort of a biologist, but describing the rise of multicellular life as "altruistic" seems a bit off to me. Maybe it is just because I have been reading so much of Greg Cochran's acerbic wit recently, but I think you get a lot more out of evolution and genetics if you take the time to understand the mechanisms by which they work before you write a book on it. Obviously, it didn't hurt Wright's career to speak loosely in this fashion. Properties, then, tend to be imitated or circumvented by competing organisms over the long run, even though the particular species, lineages and cultures that developed them may die out. Die-offs sprinkle the fossil record, but none yet has sent life back to the primordial soup. Civilizations may rise and fall, but technologies like metallurgy and literacy persist even through dark ages. I just think you get more out of the idea once you that in some cases the genes that cause certain adaptations can outlive the species in which they originate, sometimes ending up in truly strange places, and also that convergent evolution can come up with the same solution more than once if the payoff is big enough. Since in a sense genes are information, it probably is interesting and useful to compare this mechanism to the ways technologies and cultural behaviors sometimes outlive the cultures the created them. It is probably also easy to go too far here. I had clearly read this before, but it is interesting to be reminded that the mid-twentieth century turn against teleology and final causes was initially primarily directed against Marxists. If this book is a harbinger of things to come, Teilhard de Chardin and Arnold Toynbee are back. So, perhaps, are many other features of the universalizing historical optimism of the middle 20th century. Once again, people will think of cultural history as the culmination of biological history. Societies will be ranked as lower and higher, and the latter will be preferred to the former. Morality will be grounded in ontology. World government will be seen to be inevitable. Maybe SUVs will start to sprout 1950s-style tailfins. Even historical determinism allows for some surprises. Robert Wright is the author of "The Moral Animal" and "Three Scientists and Their Gods." He has been trying for some years to tie together popular genetics, moral theory and public policy, usually to provocative effect. In "Nonzero," Wright provides a witty critique of the "relativism," for lack of a better term, that came to dominate so much of the last century's anthropology and even evolutionary theory. He does this in the context of explaining the implications of a simple mechanism that makes progress (no skeptical quotation marks needed) both largely linear and fairly inevitable. The critique is pretty persuasive. The universal model of history needs work. By his own account, Wright is in effect trying to rephrase Teilhard's philosophy in mechanistic terms, thus saving it from the mystical vitalism that has made it such a fat target for metaphysical materialists these past forty years. Wright's chosen mechanism is the principle of non-zero-sum interaction, a notion that comes from game theory. Interactions are said to be non-zero-sum when both parties benefit. Zero-sum interactions, in contrast, are those in which one party wins everything and the other party simply loses. The same interaction can have both zero-sum and non-zero-sum elements. In a negotiated sale from which both parties benefit, for instance, it is still possible for one party to get a better-than-necessary price at the other party's expense. In any case, an effect of non-zero-sum interactions is that the parties tend to prosper and interact again, while zero-sum parties tend to destroy or drive each other away. Thus, says Wright, the key to history is that the area of non-zero-sumness tends to increase over time. This is just as simple-minded as it sounds, but it is hard to believe there is not something to it. It is obvious enough how this kind of logic applies to the growth of trading networks and political entities. It applies even to war. Two different tribes that are seeking to occupy the same territory might have a zero-sum relationship to each other, but the exigencies of conflict tend to increase the level of non-zero-sumness within each group as it organizes to defeat its rival. The same principle applies to biological evolution, according to Wright. He says he has no idea how life started. However, once it got off the ground, it benefited organisms with the same DNA to act "altruistically" toward each other, thus forming the basis for the assembly of multicellular organisms and, later, of mutual support among kin groups. The point Wright wishes to emphasize is that biology is a matter of information transfer and feedback, in a sense that is more than trivially analogous to, say, a financial system or the interaction that goes on over time among scientists and inventors. The means by which non-zero-sumness advances is the discovery, by internally altruistic units, of new "properties" that advance their interests. In biology, these properties include abilities that range from endothermy to flight to the various sorts and levels of intelligence. In cultural evolution, they are "memes," skills and ideas from basket weaving to literacy to the Nicene Creed. These properties are only in part adaptations to a nonliving environment. The environment for organisms consists for the most part of other organisms, just as society is other people. Properties, then, tend to be imitated or circumvented by competing organisms over the long run, even though the particular species, lineages and cultures that developed them may die out. Die-offs sprinkle the fossil record, but none yet has sent life back to the primordial soup. Civilizations may rise and fall, but technologies like metallurgy and literacy persist even through dark ages. "Nonzero" repeats the critique that Wright has recently made of Stephen Jay Gould's persistent efforts to cast biological history as a pure "random walk," a process with no particular direction that certainly was not likely to produce tool-and-language using entities like ourselves. It may be a rhetorical flourish on Wright's part to say that he, too, would be a creationist if Gould's ideas really represented the best that evolutionary science could do. Still, by marshaling both the factual problems that Gould's interpretations have encountered in recent years, alongside a catalogue of familiar objections that Gould has studiously declined to address, Wright does make the popular-science relativism that Gould has been promoting look very flimsy indeed. Wright, for his part, does think that evolution was very likely to produce creatures like ourselves. He further thinks that cultural evolution was bound to be a story in which, after a slow start, technology would grow ever more powerful and the size of social organizations would tend to increase. Additionally, patterns of non-zero-sum cooperation would tend to win out against zero-sum oppression within societies and against zero-sum predation between societies. The latest evolutionary property that Wright sees emerging in the world is the incarnation of Teilhard's "noosphere," the global community of mind, in the form of the Internet. We are now, he says, in "the storm before the calm." Patterns of cultural and economic exchange have become planet-wide, while governments are still national or regional. It is one of the laws of history, he tells us, that systems of governance tend to expand to cover economic systems. Thus, though we may be in for some "instabilities of transition," a unified world is not very far in the future, and non-zero-sumness will be all in all. It is, perhaps, some argument against the hypothesis of history as a perfectly progressive process that universal optimism seems to have grown coarser since the last time Teilhard and Toynbee were in flower. Whatever their other failings, they at least expected some historical sense in their readers, and their theories were informed by an ancient philosophical tradition. Wright, in contrast, has no other resource but to rattle Richard Dawkin's dinky little memes around in an algorithmic tin can. This restriction of the argument to reductionist premises is deliberate. Wright is trying to show that, even assuming a world wholly devoid of spirit or the supernatural, history would still have direction and even meaning. He wraps up his mechanistic model of history with the acknowledgment that the real world is clearly not as threadbare as the behaviorists would have it, and indulges in some theological speculation about what a world that is only potentially good might tell us about God. Even within the limits that Wright has set himself, there are problems with his model of history as an information processing system. The chief of these is that the book has no sense of non-linearity (or, in older terms, of the dialectic). There are in fact some eras when human beings become more numerous, freer and richer. We are living in such an era now. However, history does not show a smoothly rising graph of any of these things (population included). In fact, setbacks, reversals and long periods of stasis seem to be inherent in history, both human and biological. This is one area in which Wright might have been more patient with the heresiarch Gould, whose idea of punctuated equilibrium really does tell us quite a lot about how the world works. 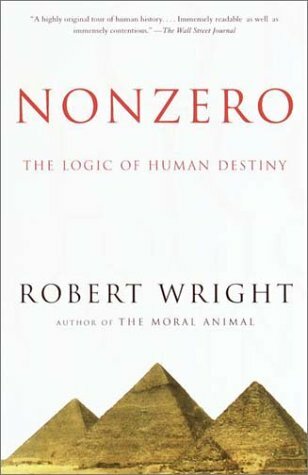 Though one could add many other reservations about "Nonzero," and even wish that Wright had written the book from a broader perspective, reasonable people may nonetheless conclude that the book's basic thesis is more correct than otherwise. In any case, there is some reason to suppose that this may be a thesis whose time has come. Wright notes the liberal politics of the 1920s made cultural anthropology skittish about the idea of progressive cultural evolution, and that the revolt that began at midcentury against teleology in all its forms had an anti-Marxist inspiration. (Gould's ideas seem to have been inspired by a fear of religion, but that's another story.) Today, after the recoil into state control that characterized the 20th century, the process of global economic and cultural integration is once again reaching deep into the domestic life of the world's societies. Even people who say they oppose "globalization" usually mean that they want the process to be controlled by universal regulators of one kind or another. Though the sides in world politics are becoming more distinct, they still lack coherent theories. The chance that the politics of globalization will incorporate ideas like Wright's is distinctly nonzero. At Edward Feser's blog, he talks about the relations between algorithms, information theory, and teleology. He is addressing the question of whether the algorithm-like behavior that we can observe in the natural world means there is purpose in the natural world. This is addressed in Feser's book, the Last Superstition. A commenter objected that the regularity of nature cannot be identified with purpose because we do not that the regularity of the seasons, or the shape of planetary orbits serves any identifiable purpose at all, thus we cannot claim this demonstrates teleology in nature. However, this is something that Feser, like Aquinas before him, actually agrees with. It is not that we can figure out the purpose of creating elliptical orbits, it is rather that orbits are always elliptical that manifests teleology in nature. The very regularity of nature bespeaks a tendency of a certain cause to produce a certain result, more or less frequently. That almost everyone implicitly believes this is one of the strengths of the Aristotelian and Thomist traditions. To extend the argument further, Jim Franklin argues in his article, The Formal Sciences Discover the Philosophers' Stone,that the modern methods of sciences like information theory and cybernetics work in the broad way that they do because they actually work by isolating formal causes, and reasoning from them. This allows us to achieve deductive certainty about real things simply by considering the kinds of relations that arise from form. Feser complains in his article that there is a tendency today to use in-principle explanatory talk of information theory and computer science to explain things like the mind in a materialistic fashion that obscure critical details and make it plausible to believe that the mind is just matter organized in a certain fashion. This complaint is largely correct, but I think it maybe possible to turn this tendency upon itself, much like the very success of modern science belies the naturalistic interpretations of it, the reliance upon formal arguments of this kind belie the naturalistic interpretation of science that modern science deals only with material observables, when in fact is extremely common for science to deal with entirely formal, immaterial constructs such as "information" that can be abstracted entirely from the particular material things they are found in. To even speak of information theory is to resurrect essence.